I really hate to admit this, but for the sake of you not feeling alone in your initial reaction to these pictures, I wanted to face plant into this cake, too! And another thing I’m not so proud of either? I made this cake before church and it was ALL I could think about during church. 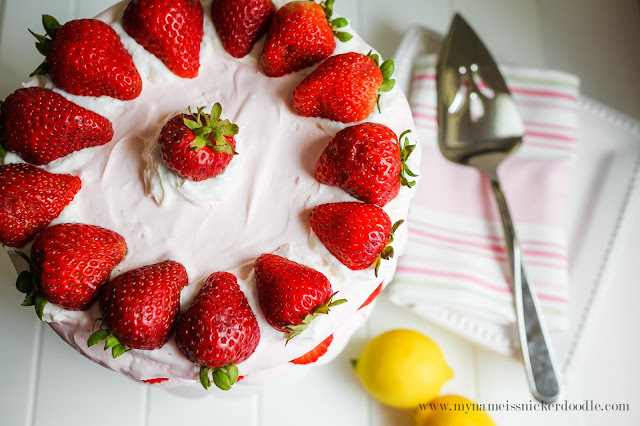 I had to get back to this Strawberry Lemonade Cake that I’d created with just a few ingredients! This was a recipe that just came to me and evolved along the way in making it. I was drinking a glass of Strawberry Lemonade one day and the thought came to me. How could I turn this into a cake? It’s no invention of the light bulb, but man! It sure is a super fabulous dessert! Most of the flavor is in the flavored whipped cream. Slightly tart, but refreshing at the same time. 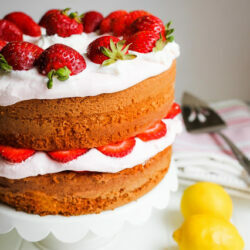 Then the tartness is balanced out with the lemon cake and fresh strawberries. Like EATING your favorite strawberry lemonade drink! Grease and flour two 8 inch circle cake pans and set aside. In a standing mixer mix together cake mix, pudding mix, eggs, oil and water together for 2 minutes. Divide batter between both cake pans and spread out evenly. Bake for 30-35 minutes or until an inserted toothpick comes out clean when inserted into the middle. Remove from the oven and allow to cool in the pan for 10 minutes. Run a sharp knife around the edges of the pan to release the cake from the sides. Turn out onto a cooling wrack and cool another 10 minutes. Cut off any domes that have formed on top of the cake to level it. 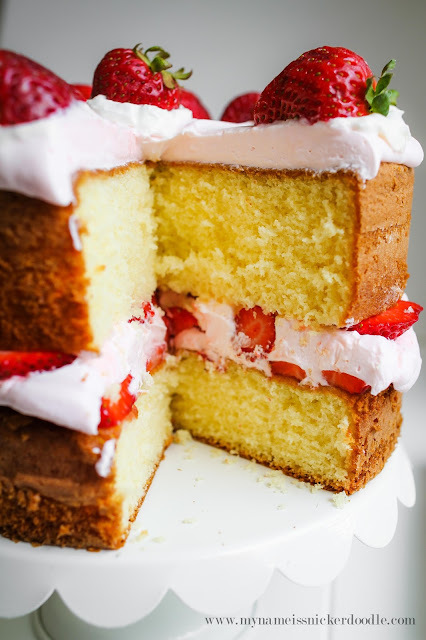 Wrap each cake completely in plastic wrap and chill in the fridge for 2 hours or over night. 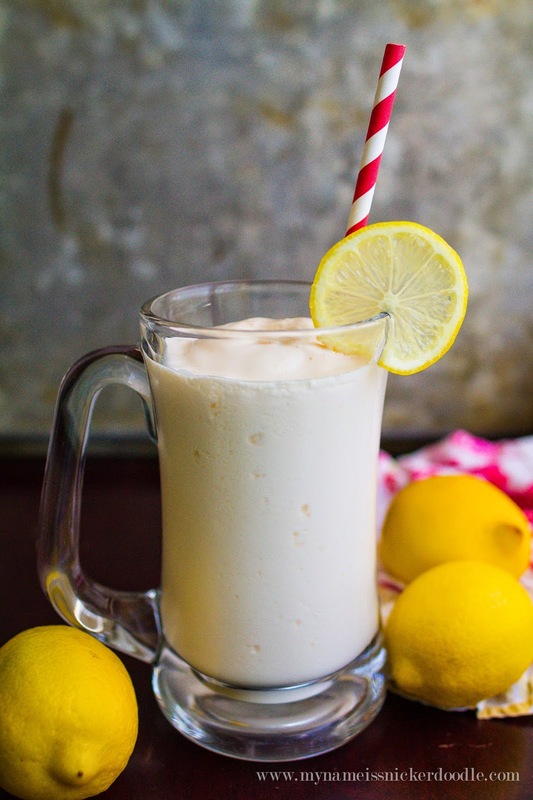 In a standing mixer beat together whipping cream and lemonade mix on high for about 3-5 minutes until medium peaks form. Chill until ready to assemble cake. Hull and slice about 8 oz. of the strawberries. Save some whole strawberries for the garnish on top. 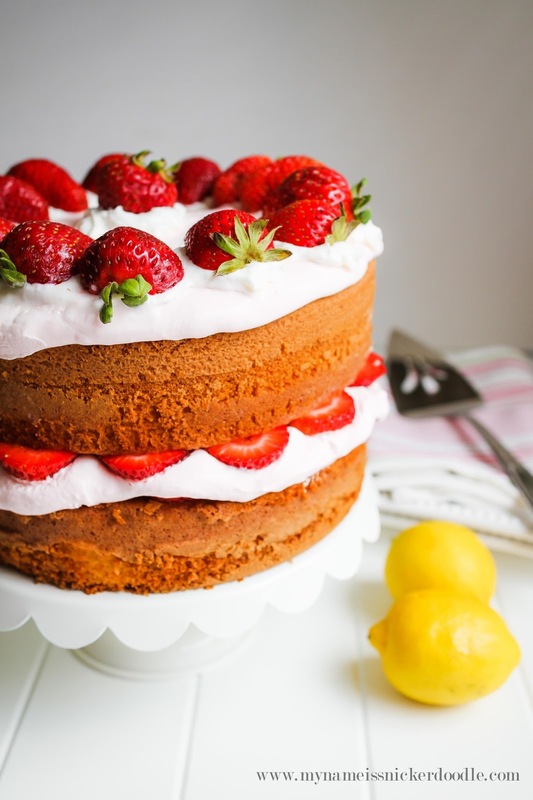 Place sliced strawberries over the top in a single layer. Spoon about 1 1/2 cups of whipped cream on top and spread out evenly. Place another single layer of strawberries over the top of the cream. Lay the second layer over the top with the bottom of the cake facing up. "Frost" the top with the remaining whipped cream. 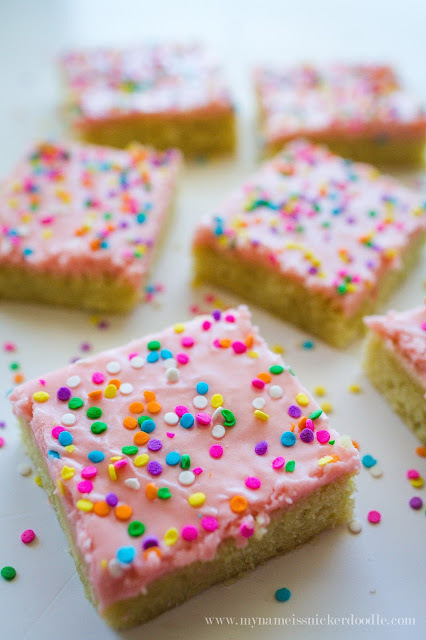 Try my Frosted Lemonade or Sugar Cookie Sprinkle Bars for another fun treat! 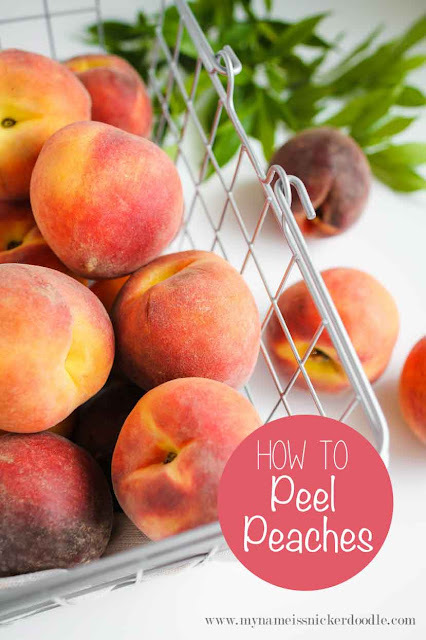 And for all those summertime fresh peach cobblers you’ll be making, I’ve got a great tutorial of how to peel peaches perfectly! Oh yummy!! I would love to eat this now! !